Have you ever seen people take awesome sketch notes on their iPad or at a flipchart? Or maybe you have seen one of those popular hand-drawn videos and thought, "I can do that!" 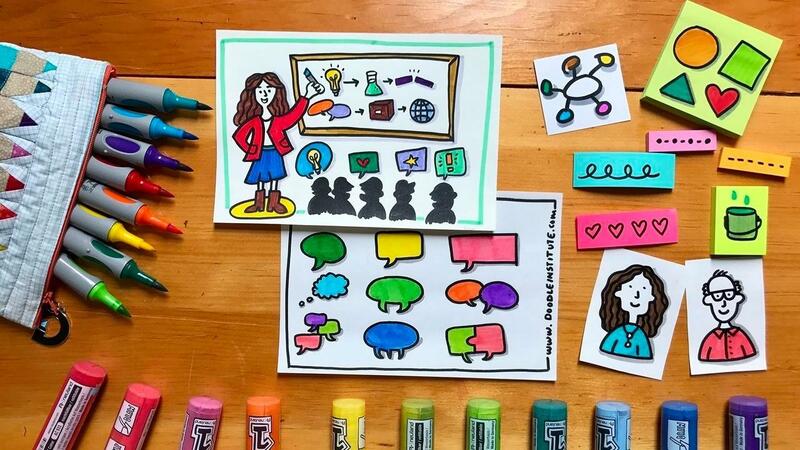 It is actually called Graphic Recording and it is a growing industry for artists who are looking to build their own business being CREATIVE at WORK! The industry of Graphic Recording GROWING like crazy and we need CREATIVE THINKERS like YOU! Three reasons why you should consider becoming a GRAPHIC RECORDER? You can build a successful career as Graphic Recorder. It all comes down to practice, your toolkit and mentoring. Join the "Doodling is Thinking" Movement. Have you seen the books Back of the Napkin or Doodle Revolution - Business people are reading these books and they want to hire Graphic Recorders to bring more CREATIVITY to WORK! 3. Clients are Looking For YOU! Every day, people online are searching for people like YOU with the knowledge, experience, and passion to bring IDEAS to LIFE. It's time to get paid for doing what you LOVE! Graphic Recording is a skill that can be learned and used in any line of work. Are you a teacher, coach, therapist, trainer, homeschooler or facilitator?